Anyone who has had the pleasure of having a furry family member can certainly appreciate the love and joy that they bring to our lives. They can even help our to improve our mental health. How many of us would take a walk outside after coming home exhausted from a long day at work if not for our dog? How many of us have been comforted at times by a warm furry being when we really didn’t feel like being with any other human at all? Pets increase our physical activity, provide companionship, add structure and routine to our day, help us to meet people, help to decrease our stress level and providing us with a sense of purpose. The tactile stimulation provided by stroking a pet can ease loneliness, provide unconditional love and help to decrease agitation, anxiety and depression. Pet therapy, or animal-assisted therapy, is recognized by the National Institute of Mental Health as a method of treatment for depression, and other mood disorders. Enter my very own furry family member Louie. Louie was four years old when the OSPCA removed him and his puppies from an abusive home. His puppies were adopted out quickly, but not Louie. He was shy and skittish, and didn’t make a great first impression. Through a colleague, I learned of Louie and thought he would be a perfect addition to our family. Louie took to our family immediately, especially to our children. He seeks them out when they are upset and allows them to hold him and pet him. 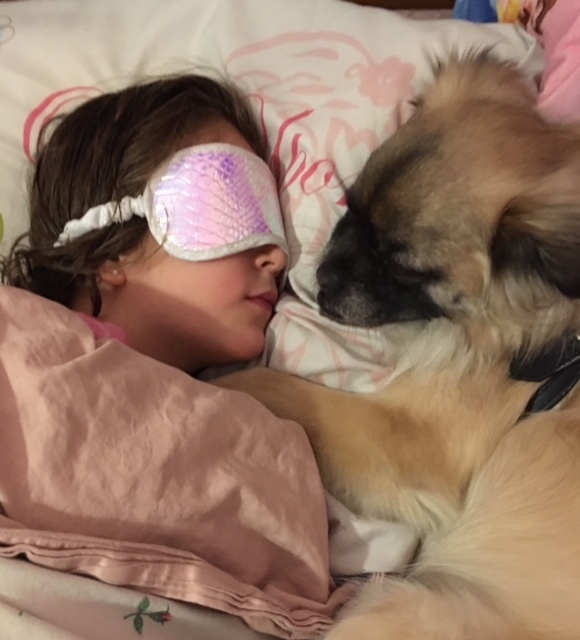 At bed time, he will come racing from wherever he is to lay on his side, nose to nose with each child while they fall asleep – sometimes even resting his paws on their heads. Through life and battles with depression and anxiety Louie has provided unconditional love and support for our family in a way I don’t think we ever could. Pet ownership isn’t for everyone and I would never suggest anyone adopt a pet without being prepared for the responsibilities that come with it. In the spirit of Mental Health week, along with bringing awareness to our own mental health, it is important to give credit to our pets and the help they provide for us in so many unexpected ways.